Students reading in the Isenberg Elementary School Media Center. After worship, on Sept. 9, St. John’s members will have the opportunity to serve at Isenberg Elementary School. “God’s work. Our hands.” is a ELCA-wide event, bringing church members together to volunteer in communities all over the country. At St. John’s, the event has been known as St. John’s Serves, but this year is tied into the nationwide day of service, says Pastor Laura Henrik, pastor for discipleship. Pastor Laura is issuing a special call to all artists, as one of the projects will be painting inspirational quotes on the walls in the media center. Another media center project involves scanning in library books for inventory. A second seated project is assembling gift bags for teachers. Volunteers will also be sprucing up nature trails and perhaps creating some outdoor learning spaces, so bring rakes and shovels along if you’re interested. Pastor Laura is issuing a special call to all artists to pain inspirational quotes on the walls in the media center, but there are also seated opportunities to serve, like scanning books and assembling gift bags. On Sept. 9, Marvin Moore, Isenberg’s principal, will be in worship to remind members of the special day. We will meet after church at Isenberg at 1 pm. We will wrap up our day of service by 3 pm. Sometimes, says Karen Puckett, the schools are an easy target for criticism. Puckett, a St. John’s member, is media center coordinator for Isenberg. Puckett is also gearing up for another year of the Gator Reading Program. Volunteers are asked to meet twice a week for 45 minutes around lunchtime to read with a child. Many volunteers share reading duties with one student, and come to the school once a week. The program will begin in October after in-house testing is complete. “We’d love to have 10-15 volunteers for third-graders and 10-15 volunteers for second-graders,” she notes. 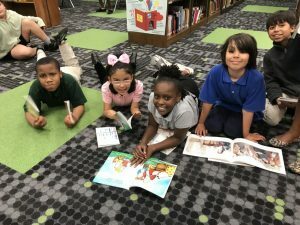 If you’d like to participate in the Gator Reading Program, contact Karen Puckett at Isenberg Elementary School, at karenmcgeepuckett@gmail.com.